The latest film from Martin Scorsese, ‘Silence’, is the culmination of 25 years of development to bring Shusaka Endo’s 1966 novel to the screen, and it’s a challenging yet ultimately fascinating and rewarding watch. ‘Silence’ has been a passion project of Scorsese’s for some time, but its subject matter perhaps explains the length of time its taken to come to fruition, and this is undoubtedly a film that is unlikely to appeal to the masses. It’s a historical religious epic set in 17th century Japan, following two Portuguese Jesuit priests who travel to Japan to locate their mentor who is believed to have apostatised after being tortured. After the scene is set in the opening, the film joins the priests (Andrew Garfield and Adam Driver) as they travel to Japan under cover of darkness with a guide (Yosuke Kubozuka), who leads them to a small village of Japanese Christians who hide their religion from outsiders over fear of the consequences. There are many ways to read into the themes that ‘Silence’ explores throughout its runtime and I found its approach to the Japanese culture at the time particularly fascinating. Through Father Rodrigues (Garfield), we have a young priest with a naïve and unwieldy belief in his religion, and it never occurs to him that he’s fighting a losing battle against a people who do not wish to embrace his beliefs. To a certain extent, ‘Silence’ can be read as the story of the failed attempt to bring Christianity to the masses of Japan, and the undue suffering caused by those who failed to recognise this failure, Father Rodrigues included. I felt the film shows Father Rodrigues journey well as he travels through different parts of Japan and gradually starts to realise what he’s up against, and I found it especially powerful once we re-encounter Liam Neeson’s Father Ferreira and learn his story. I half expected Ferreira to be a Colonel Kurtz-esque figure, seduced and brainwashed by the regime he sought to argue against, but the reality is a lot more low key and philosophically interesting than that. The encounters between Rodrigues and Ferreira are spellbinding and feature some of the richest dialogue I’ve seen in some time, and the parallels the script draws between the two men at different stages of their lives, and their journeys, was cleverly done. ‘Silence’ doesn’t remotely shy away from the brutality of the Japanese regime, and the film features some of the bleakest and brutal moments I’ve seen on film recently. There’s almost no hope on display, only pain, and it’s horrifying to watch countless people suffering on account of their beliefs, but it’s an important and harsh depiction of the way religion is often used as rationale for persecution and deep cruelty. 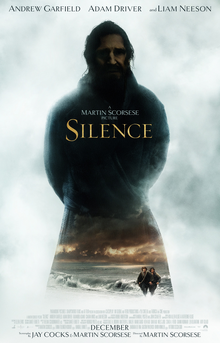 This does make ‘Silence’ a difficult watch at times, and in the early goings I struggled with it’s leisurely pace, but at some point I felt like the story started to coalesce and I was fully on board with Father Rodrigues (helped by Andrew Garfield’s excellent performance) plight and the journey he’s on. Throughout the film’s narrative, Scorsese explores different areas and poses many questions about spirituality and the nature of humanity, yet I never got and never expected any answers, nor does the film promise them. Beyond the narrative itself, the film is gorgeous to look at with wonderful cinematography (the wide shots of the waterfronts with the beaches, cliffs and crashing waves in particular) and the performances are uniformly excellent from both the Japanese cast and the ‘bigger’ names. ‘Silence’ is a film that likely wouldn’t be made if it didn’t have the power of a major name like Martin Scorsese behind it, and it’s great that in an era of blockbusters and comic book adaptations dominating the box office that there are still some people who have the power to make intelligent dramas aimed at adults with lofty themes that may not appeal to a mainstream audience. ‘Silence’ isn’t perfect and I found it a challenging watch at times, but I came out impressed in many ways and I felt that overall, it was a richly rewarding experience.